As we age, we naturally become more forgetful, meaning we may have a difficult time remembering where we put our things. 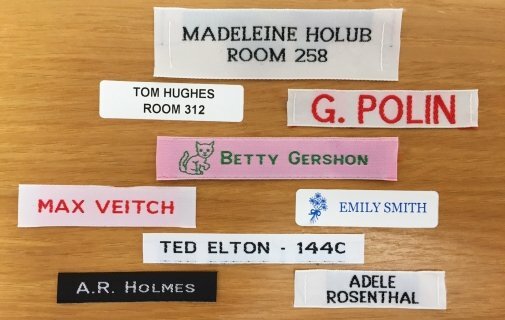 To help your elderly loved ones keep track of their clothing, It’s Mine Labels has compiled a list of custom clothing labels to attach to their garments and help make life a little easier. Here is a list of clothing labels that are perfect for seniors. Snap-On Tags: Snappy Tags are ideal for seniors. They are attached to the clothing care sewing label through the use of an applicator, are applied in seconds and don’t come off unless you remove them with the same applicator. These buttons are soft and useful since you can print your loved one’s name right onto the button and attach this to the sewing label that is already sewn into their garment. Iron On Satin Labels: These labels are available in black or white, don’t have additional thread, and are made from super soft satin, making them the ideal label for those with sensitive skin. These are particularly popular for seniors since they are soft and easy to attach. Ink Transfers: Ink transfers are available in letter transfers as well, and are even softer for sensitive skin. These don’t have any additional fabric or thread that can cause irritation. Allergy Labels: If your loved ones are moving to a home, you need to make sure everyone knows about any potentially life-threatening allergies. These labels have the allergy and their name on the label, and are stick-on, so that they may be attached to items like cups, plates, and more.